Although Armstrong referred to this house as being a "Small House in Glendale", it is actually located in the municipality of Oakland, next to Glendale. I'm not sure why he referred to it in this manner and why he didn't note the name of the owner. The house was built for a school teacher named Katherine Moore. 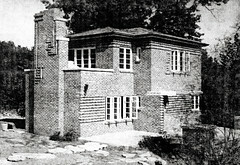 With its very shallow hipped roof and horizontally grouped casement windows, it is a close relative of his Cori House exhibiting some similar characteristics, such as the second floor balcony with adjacent chimney, brick masonry construction, corner windows, and the cantilevered overhang over the main entry.